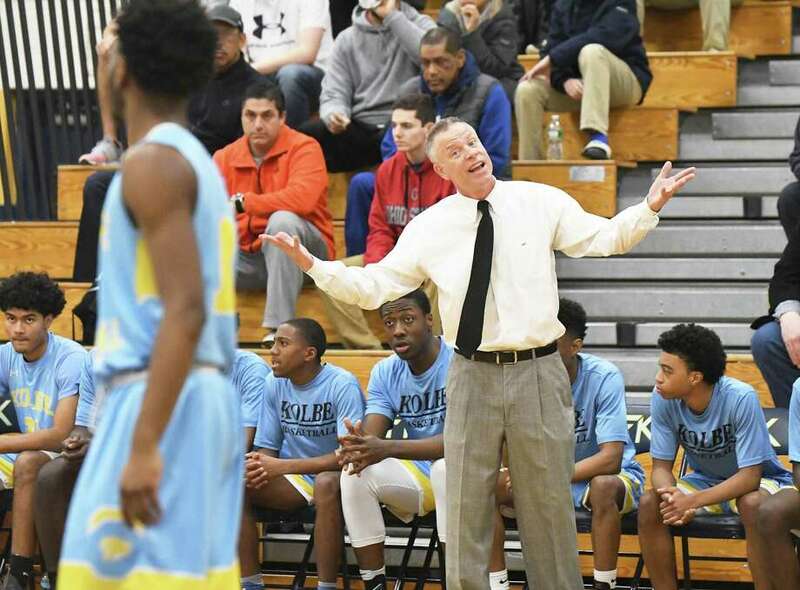 To argue too loudly about Kolbe Cathedral petitioning a move down a division in the new CIAC basketball tournament format is to shout down the resolve of a group of young men in search of great renewal. Yet to ignore the argument of how schools of choice fit into the landscape of boys’ state basketball is to ignore the greatest challenge of high school sports in Connecticut. That would not be fair either. I am new to Hearst Connecticut Media, but I am old to the argument over where Catholic, magnet and other schools of choice should be placed in divisions among public schools with borders. I have watched as a sports columnist. I have watched as a dad of a player twice knocked out of the state tournament by Notre Dame-Fairfield. My criticism boiled over in my former position at The Hartford Courant when a super team from Sacred Heart, led by Mustapha Heron, was allowed to roll against all competitive logic to the 2016 Class M title. My roar quieted to a silent sick feeling when I read an email from a Westbrook resident on how that small shoreline town’s once in-a-generation team should never have had to play Trinity Catholic in the 2017 Class S championship. A change was badly needed and the CIAC put together a one-year experiment, changing four alphabetical classes into five numerical divisions. No system is perfect, but the 2018 road to Mohegan Sun for the state championships has been a good one. Division I produced a slew of unforgettable games. Division II afforded large enrollment schools without great basketball pedigree chances to shine. The smaller public schools have been given better chances. And then, screech! Throw the brakes! There’s Kolbe Cathedral. After the new divisions were set up, schools were allowed to appeal their placing to the CIAC. Nineteen schools did, according to Gregg Simon, CIAC associate executive director. Only Darien and Kolbe won their appeals. Kolbe dropped from Division III to IV. Granted, the optics were not great. A school of choice, one with a storied basketball history, dropping to the second lowest division? And now advancing to its 10th state championship game against Rocky Hill on Sunday afternoon? Me? I was going to make a beeline to Kolbe’s John Pfohl during the CIAC luncheon Thursday. Pfohl, who won 315 games and two state championships at Kolbe from 1993-2008, returned to the school after last season. Pfohl is no ordinary high school basketball coach. Kolbe went 1-19 last season. Kolbe lost all its games in 2014-2015. Lot to fix? You think? “What I found early on was their acceptance of me, my intensity and the way we were going to do things, which were different than the past,” Pfohl said. “My expectations were going to be a little higher They embraced it. They wanted to learn. They didn’t want to be 1-19. A school of choice goes from 1-19 to 20-6 and I know what you’re thinking. Pfohl solved his problem by getting all new players. Wrong. He has used four seniors, led by Anthony Senior, in his starting lineup. Senior, Kyle Federici, Demetrius Gordon, Naz Vereen along with junior Quinton Sneed all played on that 1-19 team. So did sixth man Evan Coleman. Their one non-freshman transfer split his time between varsity and jayvee. Pfohl resigned from Kolbe in 2008 in order to watch his kids Victoria, Alexa, Amanda and John play basketball for Trumbull High. Each was a terrific player. When he walked back into Kolbe, which had been in Class S for a decade, he ran smack into a new format. “I went to the principal [Henry Rondon] and went, ‘Help me out here,’ Pfohl said. “This doesn’t make a lot of sense to me. We’re 7-53 and the basis of this thing is the last three years. We were in the lowest class and we were moved up into the middle. It doesn’t seem like we are setting ourselves up for any kind of success. One of the things the athletic directors had insisted on, according to Simon, was an appeals process with the CIAC. There is a message in this. And, I think Pfohl hit on it when he said, “One size does not fit all.” The school of choice argument has grown so hot that the gray area burned up. Each argument should be weighed individually. “You want to have a school of choice tournament vs. non-school of choice?” Pfohl said. “Great. Let’s do it. The problem with that is there are going to be a lot of public schools that will be in the school of choice. I live in Trumbull. Trumbull has a vo-ag program. School of choice. In other words, with success Kolbe will move up. I think it often goes overlooked that the kids and players are just athletes looking to improve, win games and have some fun along the way. Everyone seems to have focused on Kolbe this year as the flaw to this new system but how about the job done by the coaches and players to win 20 games and beat some good teams to get to a state final. Valley has been one of the states strongest middle level programs over the last 10 years. Northwestern has won 6 of the last 8 Berkshire titles and had a very good senior laden team this year. Even Ellington has a good program for an M school in the NCCC. All 3 were games Kolbe trailed in. This isn’t Sacred Heart throwing down a dozen alley oop dunks and players throwing themselves dunks off the back board against Killingly (in a real life state tournament game). Go watch the highlight reel of that game if you want a good laugh. I also think division 4 may have been the weakest of the 5 divisions. Kolbe was the clear cut favorite but there didn’t seem to be anyone else in the division that stood out. The three best shoreline teams were in division 5. Canton the NCCC champ also in 5. Wamogo the BL champ in 5. Even Capital Prep which may have been the strongest of the Hartford magnets was in 5. It set up perfectly for a low seed from a strong conference to make a run like Rocky Hill did. Where Can I find that highlight reel game of Sacred Heart? They have tremendous history and u penalize all div 4 teams. Tell me how many div 4 schools did Kolbe play in season? Most of rest in div 2 some div 3 yet they get div 4 tourney. Firstly, I watched John Pfohl coach a couple of times this past year and I am not surprised how well he did with a team that couldnt get out of its own way the past few years. The things he is doing for those young men are beyond amazing. While he is loud and brash i can guarantee you that each and every one of his players know he is there for them and will do anything for them. This was a great article which looked at both sides of the coin, I think that the new setup is interesting but still very flawed. For me my interest is solely in the d1 bracket, that is the one that has the big time teams and programs in it. The rest of the divisions are playing but i am having a hard time being interested in them. Kolbe was a decent team this year, but not a team that should be hanging up a state championship banner by any stretch. they came in 3rd place in their division and were beaten in the first round of the SWC playoffs. Thats not what i think of when i say state champion. I honestly dont see why we cant have a parochial school championship and a public school championship. maybe even take the best team from each at the end and let them play. This format will surely give us the best champion in division 1, i think it hurts the rest of hte divisions more than it helps them though. I would also suggest the ability to move teams up or down a division based upon the current season. lets face it fairfield prep at 4-16 didnt need to be in d1 just like kolbe would have probably fit into d3 after seeing what their coach did with them this year. Its amazing how much having a great coach matters. sorry, 2nd round of the swc tournament not 1st. It is true that the kids at Kolbe are not to blame. Just like the kids at Trinity Catholic last year deserved no blame. That angle to this story misses the point entirely. Kolbe’s kids should be blamed for nothing. But that does not mean that CIAC got it entirely right. The flaw in the new and improved system is that it ignores level of competition during the regular season(s), instead relying on some mysterious mix of factors such as historical performance and school enrollment. There will continue to be more Kolbe’s in future years until this oversight or loophole is addressed, particularly for borderless schools of choice. Kolbe chooses to play in the SWC – no one forces Kolbe administrators to make that choice. When they make that choice, and place their teams up against larger enrollment schools (D1, D2, D3) every week, every year, year after year, they are effectively stating that they believe they can and should compete with schools of that size, enrollment, and competitive level. Kolbe played 19 of its 20 games this year vs D1, D2, and D3 schools. (Same or nearly the same in past years, too.) But now they are playing in the D4 tournament? The kids that this article rightly gives credit to for growth and improvement over the years have played their entire high school career against D1, D2, D3 opponents. Less than 10% of their games over the last 4 years have come against D4 or D5 teams. (Same is true for Kolbe Freshman and JV teams each year.) But now it makes sense for them to “play down” for a state championship at the D4 level? Kolbe is not the issue. The loophole in the current classification criteria is the issue. Schools (like Kolbe, and others in the future certainly) can argue all they want about their record over previous seasons, or their low enrollment numbers – all those arguments are empty words. Kolbe’s actions speak louder than their words. The actions of Kolbe administrators are what CIAC needs to be paying attention to. And the actions are that Kolbe CHOOSES to be in the SWC each year and CHOOSES to play against competition that overwhelmingly is in D1, D2, and D3 – not D4 or D5. If Kolbe administrators thought that playing against bigger schools from D3 and D2 was unfair or inappropriate for their kids, why do they CHOOSE to put their kids in that situation every week, every year, year after year? I can understand the complaints but as pointed out in the article since the 2014 season Kolbe had been historically bad. While getting moved down to Division IV may have been a stretch, based on the prior 4 years it was by no means unwarranted. Otherwise I’d saythe system has been a great success. Vo-Ag programs are nowhere near the same as Catholic in terms of “schools of choice”. You must be one town over at the max and then there are limits and you have to change your academics. Catholics have no such restrictions. Kids come from miles away. I knew a kid that commuted one-way 40 minutes to play basketball for a premier Catholic school. The fact is that a “school of choice” went DOWN a level and now is playing for a championship. It looks – and is – terrible. What is the point for allowin this? That you won’t be competitive in the end of year tournament? You can change your schedule regardless of the CIAC tournament. This isn’t football – there’s no threat of injury or completely non-competitive games that embarrasses everyone involved. Plenty of teams don’t make the post-season, and D3 teams can play D4/D5 teams to get a few wins if they want. What possibly was the justification for this? We stink, make life easy for us? Coach Pfohl is experienced and knows what he is doing. He knows his talent. Did he tell the CIAC his team was going to go 0-20 in Div 3 and lose every game by 40? Kolbe couldn’t win 3 games in D3? The rule should be NEVER drop down, only UP. How is this even possible? Did Kolbe’s regular season schedule also change because of this? Was this only done so that they could play in the CIAC tournament at D4? I just don’t get the point of this at all. Football I get. Boys basketball? Ridiculous. I’ve been watching HS sports for years now, and I just watched a Catholic vs public game last night. I WENT to that Catholic schools years ago. I was stunned by the demographics of the team. It is literally 180 degrees compared to when I went there. The school didn’t change geography, and the tuition price certainly did not go down. How could it possibly be like that without scholarships being provided? There’s no way. Look I’m all for giving kids opportunity. Totally for it. But then to put a “school of choice” (or really “school of scholarship”) into a LOWER division??? Unbelievable. I’m sorry, but this decision was a disgrace. School of Choice? Really? Kolbe is a blessing in an inner city! An affordable private/Catholic school that only has 300 students in total, and definitely DOES NOT have the funding to recruit (The majority of their population comes from Bridgeport). A school that has their students education in their best & first interest, not their sports program. A school that can’t even afford their own basketball court, baseball field or have funds for proper equipment! A school that has had four new coaches in 4 years. These boys were defeated year after year, mocked and ridiculed, was that fair? And now they get a great coach who is having great success and everyone is losing their minds? This is high school basketball, not college or the NBA. Get over it!!! I still do not understand the purpose of this. By going to D4, did Kolbe’s regular season schedule change? If this is done solely for the purposes of playing in the post-season, it is completely wrong. Football makes sense. This does not. Very unfair and a horrible decision. Kolbe school of choice? Every HS in BPT is a school of choice. BPT is open enrollment so should they all be in D1? No Bridgeport is not an open enrollment, if it was they would win every year. New Haven is open enrollment. Get your facts straight. But I do agree Kobe should be div 2. Coach G are you kidding me? No open enrollment? Go ask Eddie and Farrell if there’s open enrollment. Get your facts straight. Private schools should have their own tournament. Period. If they & CIAC need more than one division, great. Have at it. It’s enough that the public schools put up with the sanctimonious BS of St. Joe, Prep, ND, Trinity, and (after an absence) Kolbe during the season. Only then will this be “fixed”. Its funny how the ciac and the state has made all theae changes and has taken all of the complaints to heart and tried to do something about it. But it makes me wonder why? In the late 80s and early 90s the Catholic schools dominated Class M except for a few runs by New London who seemed to always have to face one of them. Nothing was ever done but people did complain back then that it wasn’t fair. The Catholic schools were the real first schools of choice but nothing was done until the inner city magnet schools started popping up allowing free educations. These schools gave minority students the opportunity at better educations thus pooling some of the best athletes together. Before this the Catholics had the advantage and would occasionally be comptised of 1 or 2 of those inner city kids either on scholarship or with the means financially to attend those achools. But the magnet achools were free and would surely give the catholics a run for the money so to speak infringing on their territory. All.of.a.sudden the school.of choice argument grew to the point where things just had to be changed. Ih my how things have changed. It is very clear why this has happened but nothing was ever done back when there were no ifree inner city magnets as the catholics dominated it seemed to be ok. So now we have change, is it clear and obvious why? Who makes up the board for boys basketball at the ciac. How was Career wtby in only a few years if existence moved up I believe to D2 but Xavier a very large Catholic school with a long tradition of class LL play moved from D1 where they should have been and placed in D2. Looks like someone was still looking out for the Catholics? Someone else see the issue here besides me? Catholics and Vo-ags are not the same. They dont get the same type of talent pool to choose from in most instances. There still needs to be alot of things changed now that we are on this path! You’re missing the point. I can’t believe the issue of recruiting hasn’t come up! Section 3, Article 10 of the The CIAC Handbook is very clear about the practice of recruiting, and this is the issue. As a former public high school varsity coach, it is very difficult year after year to keep working on sustaining a program without the benefit of being able to recruit. This is the issue! The playing field in athletics is not level when your school has boundries and the private schools can choose from wherever. this is the reason why NY has two leagues and so should CT. Its time to stop dancing around the issue of recruiting, let the private schools go and have their own league and divisions. The public schools will gladly play them non league to give them games and then they can have their own playoff system. A final between the two leagues would also be a fun competition. Recruiting, financial aid, gifts and other concessions are the crux of the problem all the way back to Vito. I realize private schools have enrollment issues, so let them do whatever they need to do to maintaint enrollment, but when it comes to athletics, they should be separate from the public schools. Lets be honest anyone who saw Kolbe play in the summer league knew they would win Div 4 or div 3 for that matter. The kids who showed up in the summer were different players then the kids who went 1-19 the year before. The question whose answer is obvious in how did the show up in the summer in mid season form after finishing 1-19. I have no doubt Kolbe did nothing illegal but someone who knew what defense they wanted to play was working with those kids from April or so up to the beginning of the season.